I have been suffering from acne for the last few weeks and I reach for products that are meant for acne prone skin. 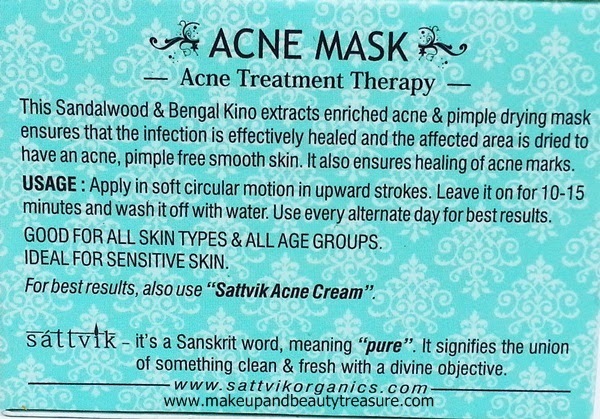 Sattvik is an Indian skincare brand that focuses on providing organic products to its consumers. 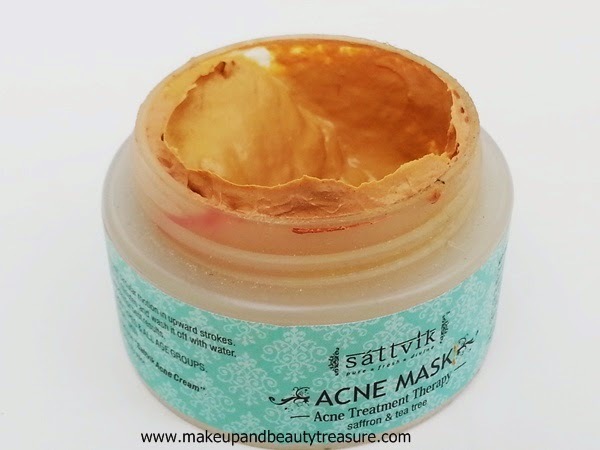 Today I am going to review Sattvik Organics Acne Face Mask. 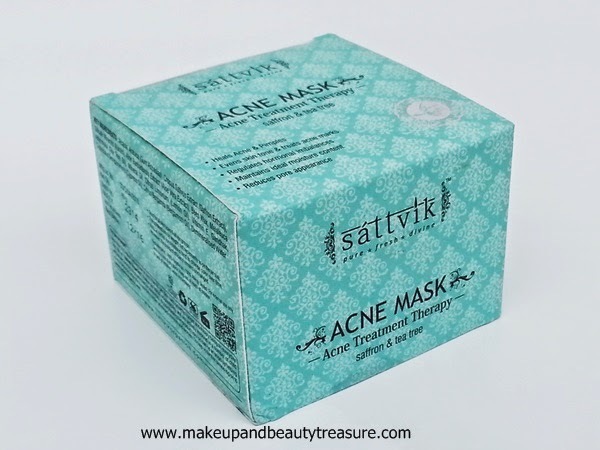 Sattvik Organics Acne Face Mask comes in a green cardboard box packaging with all the information written over it. The actual product comes in a white plastic tub with a white screw top lid. As soon as the lid is opened, you will find a thick white sheet that keeps face pack in place safe and secured. The tub is quite light and can be easily carried around in a bag while traveling. The face pack is orange in color with a mixed smell of clove and tea tree. The scent is lovely and pleasant and won’t bother sensitive noses. 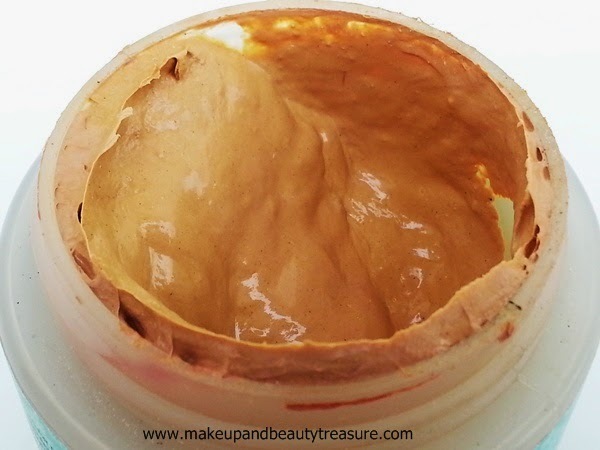 The texture of the face pack is soft and smooth with good consistency. 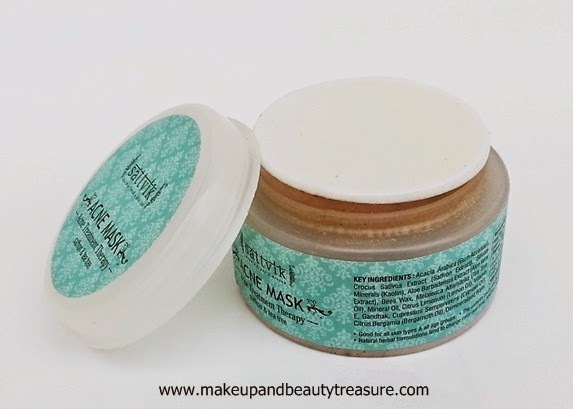 It is a ready to use mask and can be used directly from the tub. It is easy to apply and totally mess free though I wish it was available in tube. It spreads easily across my slightly damp skin without tugging. I always make sure to wash my face with a face wash to remove all dirt and grime off my face. I apply adequate amount of face pack on my face and neck and then let it sit on my skin for about 10-15 minutes. It does give a tingling sensation that gives signal that it is actually working. It does not harden or tighten the skin. It is easy to remove and gets washed off easily with water and does not leave any residue behind. The scent does not linger with me and fades away as soon as it is washed off. My skin instantly feels smooth, clean and bright. It does prevent occurring and reoccurring of pimples and acne with regular usage. I love applying it every alternate day as suggested and it does make my skin smooth, thoroughly cleansed and clearer. It gives a healthy glow to my skin. It soothes acne and lightens blemishes. It does not dry out the skin and I do not feel the immediate urge to moisturize my skin but if you have dry skin then you might need to immediately moisturize your skin. 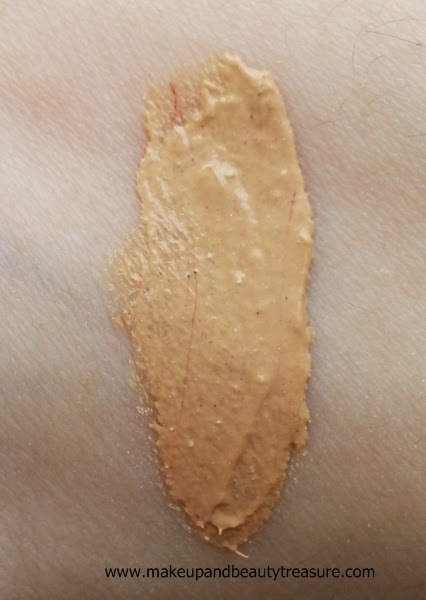 It makes my skin tone look more even as it does help in shrinking the pores (Though I don’t have major visible pores!). 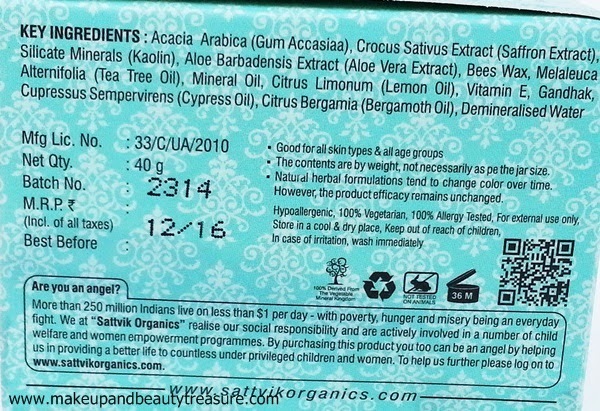 I have not faced any adverse effects whilst using it as it contains all good ingredients. Tea tree, saffron and lemon oil are great for acne and pimple prone skin and work well in preventing and combating pimples and acne. • Prevents occurring of acne with regular usage. • Makes skin smooth, clear, even and bright. • Makes pores look smaller. • Gives a healthy glow to my skin. • Quantity is slightly less. • Tub packaging might be an issue for some people though I really don’t mind! 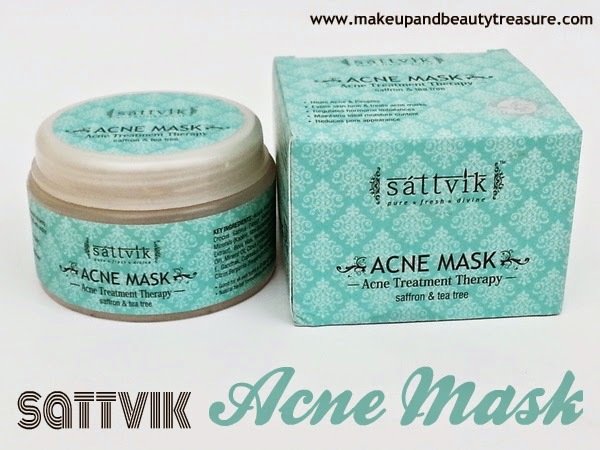 Overall Sattvik Organics Acne Face Mask is a very effective face pack for acne prone skin. It not only helps in clearing skin but gives a lovely glow to it. It is herbal and can be used every alternate day. I would definitely recommend it to everyone! 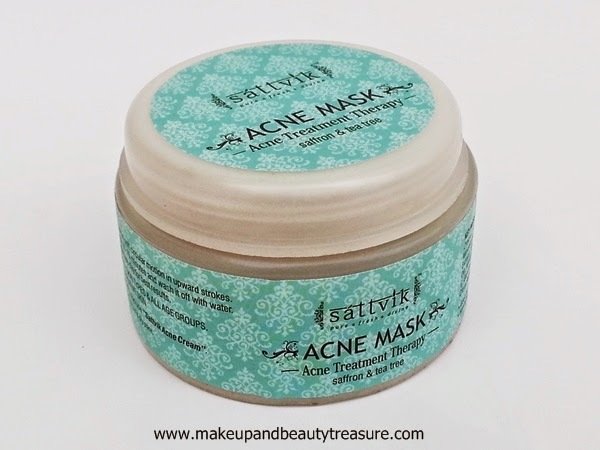 Have you tried Sattvik Organics Acne Face Mask? How was your experience? Share in the comments section below! seems a good option for people with oily skins, nice post. 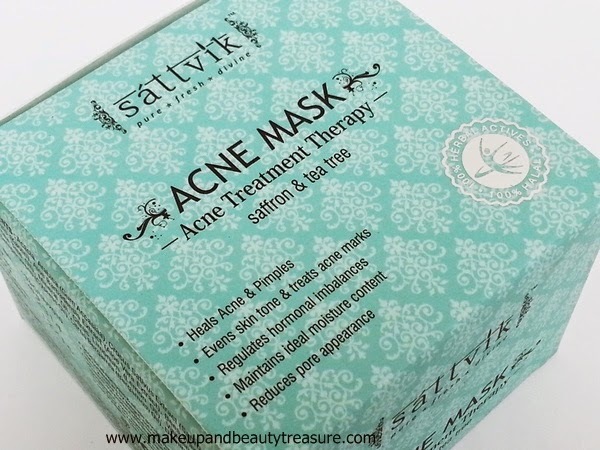 This sounds like a great treatment for acne prone skin! I like that it is effective and does not dry out the skin.